Monday was the birthday of Edward James House, Jr. of Lyon, Mississippi, better known as "Son House." He was born March 21, 1902. 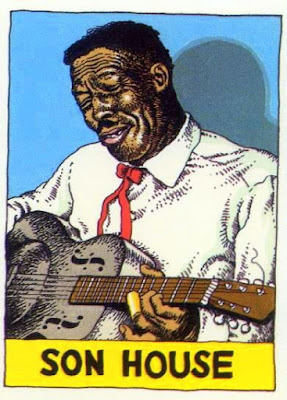 House was a contemporary of of Charlie Patton, and an inspiration to Robert Johnson and Muddy Waters. He outlived them all. House's was an archetypal hard-drinking bluesman's life, a fondness for whiskey, a stint in prison for murder. And some great, emotional songs poured out of his soul. At the age of 25 House left behind his career as a preacher to become a blues singer. Although he's generally venerated as a founding father of the Delta blues, three times in his life House saw his career as a singer fizzle as he'd fade into obscurity for years or decades at a time. House recorded several tunes in Wisconsin for the Paramount label in 1930. Then he seemingly dropped out of the music biz. He didn't record again until the early 1940s. That was with Alan Lomax, wwho recorded recorded a set of songs by House for the Library of Congress. Then House was quiet for more than 20 years. Then in 1964, he was "discovered" by record collectors (one of whom being Alan "Blind Owl" Wilson who later would help form Canned Heat) during the great folk scare. And all of a sudden House was playing festivals, coffee houses, and college campuses and started recording again, including a live album with Alan Wilson called John The Revelator The 1970 London Session. The folk scene of the '60s was long dead, but Son House kept living. He kept performing until the mid '70s. Poor health forced him to retire. He was pretty much invisible until his death in Detroit in 1988. This is embarrassing, but I just assumed he'd died sometime in the late '60s and early '70s. It's heartbreaking to think of Son House off on the sidelines, old, sick and forgotten. But today let's celebrate the wild, sometimes even frightening music Son House left behind. Here is a live performance of his signature tune "Death Letter Blues." This one is aptly titled "Scary Delta Blues." This is a color clip of a song called "Grinnin' in Your Face."